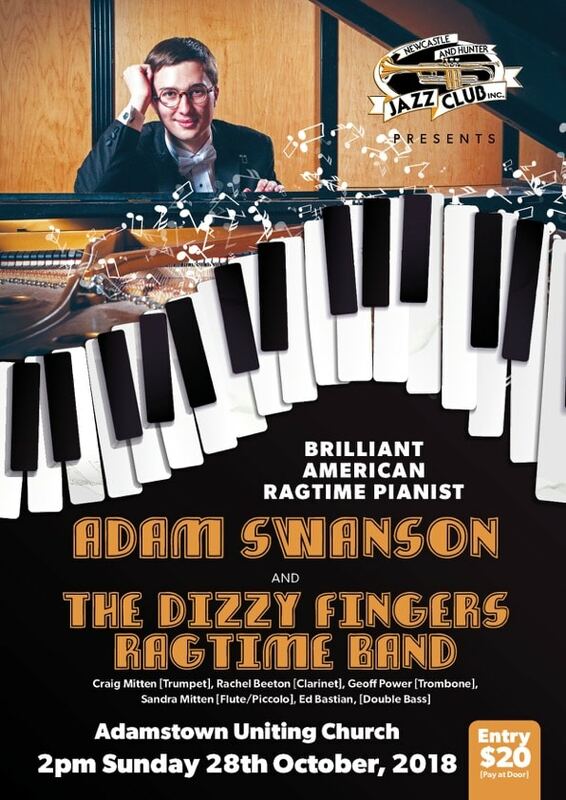 Join brilliant American Ragtime Pianist Adam Swanson and Australia’s Dizzy Fingers Ragtime Band to present a concert with an assortment of ragtime compositions, mostly from the golden years from 1895–1920 when ragtime was the dominant popular music and the dance music of the day. Adam Swanson is the foremost young ragtime enthusiast in the United States. He graduated with a bachelor’s in classical piano and completed a master’s degree in musicology at the Peabody Conservatory of Johns Hopkins University in 2015. Adam has been preforming since he was ten years old. Between 2008 and 2015, he became the only four-time winner of the World Championship Old-Time Piano Playing Contest. Adam made his New York debut at Carnegie Hall when he was nineteen and has played at the Bohem Ragtime and Jazz Festival in Hungary. He is a protege of legendary 1950s recording artist Johnny Maddox, and has played at the historic Strater Hotel in Durango, Colorado, for over ten years. Adam is an avid collector and researcher of all things associated with ragtime music and is highly sought after for both speaking and playing engagements at many ragtime and jazz festivals. We are fortunate to have secured Adam as a performer for you on his first Australian trip. Tickets $20, available at the door.